Clockwise from top, Benefit Brow Zings, Real Techniques Eyebrow Brush, Maybelline Brow Drama, Mac 212 Flat Definer Brush (travel edition). This might be the most expensive pencil you ever buy, but we are telling you it will be worth it. If you’re a low-maintenance kind of girl who wants a one-product wonder then this is for you. This pencil allows you to apply light feathery natural looking strokes that can be brushed through with the spoolie on the other end if needed. The shade range is also excellent, with specific pencils designed for those with auburn and silver hair. If you are looking to add shape and definition to your brows and prefer to have the option of building up the product for a stronger look, this handbag wonder is excellent. The kit contains a pigmented wax for shaping, a powder for setting, a mini pair of tweezers, a hard angled brush and a blending brush. Available in three shades: light, medium and deep. For everyday subtle definition, this subtly coloured gel is a fantastic multipurpose product that grooms, sets and adds colour in just one sweep. The domed brush also makes application a pleasure even for a brow shaping newbie. If you are lucky enough to have full and well-defined brows then you may prefer to keep things simple. Work with what God gave you and instead of piling on the colour just sweep through a slick of this clear gel to fix the eyebrows into place. For information on brow enhancing treatments, see our eyebrow tinting, waxing, threading and HD Brows pages to find out more. 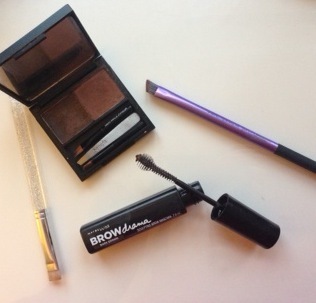 What are your must-have brow grooming and styling products? Please leave any suggestions in the comments below.